My husband is an astrophotographer. 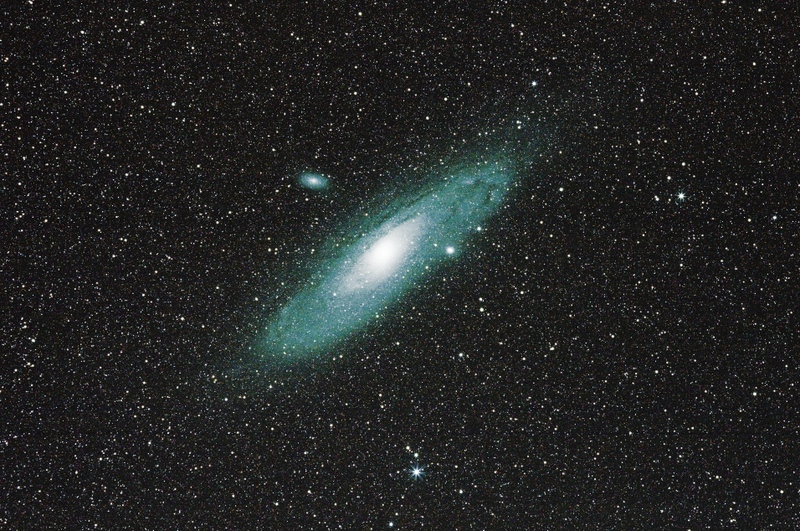 This photo of Andromeda was taken August 11 in the early morning hours. Taking pictures of extraterrestial objects is far more difficult than it looks. Timed exposures of the sky have to account for the crazy, spinning, wobbling rotation of the earth. And the more I learn about that, the more grateful I am for gravity which keeps us all from being thrown wildly off into space. So you have to program a camera to turn at the exact same speed as the rotation of the earth or your pics are fuzzy. Micrometers matter. Milliseconds matter. They do make telescope mounts that can be programmed, but let me tell you…they are not cheap or easy to use. It helps to have some technical background and the persistence to experiment , fail, and try again. And again. And again. Andromeda is 2.5 million light years away. Reminder: One light year, for those of us who need a refresher in middle school science, is the distance light travels in one year. The speed of light is 186,000 miles a second. The numbers are mind-blowing and therefore add some perspective to our pitiful existence. We are minutiae in the universe. A petri dish in the back of God’s refrigerator. And let’s not even get into the idea of quantum physics–in which case, our viewing of Andromeda may cause it to change properties. So, once in awhile I step back and contemplate the universe. My problems look so small. And yet, I’m here to look. I’m here to observe, to draw conclusions and to appreciate what I see. I don’t ever expect to understand the mystery of all this. But the older I get, the more comfortable I am with mystery. I don’t know. You don’t know. No one knows. And I guess that puts us all on even footing–on one small planet at the edge of the Milky Way Galaxy. This entry was posted in Creativity, Nature and tagged astrophotography by edges. Bookmark the permalink.